Do You (y) Facebook's New Like-Button Emoticon? 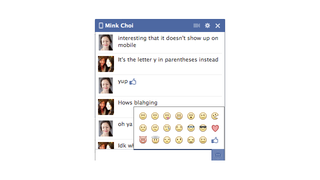 Facebook has added probably the facebookiest emoticon imaginable to its chat service menu. Yup, a twee, tiny Like button can now be inserted into conversations by typing (y). As it turns out, the tiny thumbs-up doesn't show up on Facebook for iOS—yet—so, best to just stick with the plain old English word, if you want to keep from confusing your friends.